Those of you who know me, know my great love for the nations. Now, if only I could get some free air miles… For those of you who want to grow in God’s love for all peoples, here is a great opportunity! 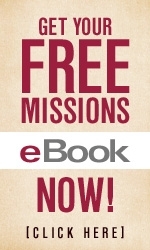 The Missional Mind community continues to grow with more and more people opting in all the time to receive the monthly e-newsletter and free missions eBook downloads–you can join! Go here to receive the monthly e-newsletter that will feature missional articles. You will also get six instant downloadable free missions eBooks, including the six country sample of the all new Operation World, not due out until August. Join the conversation on The Missional Mind and make us all richer. You can also become a part of the The Missional Mind Podcast which will feature interviews with other authors who have published with Authentic. I am proud of the caliber (not your run-of-the-mill pop Christian writing) of the books with Authentic and am honored to work with them. Previous Post Just the Facts.